Both pieces are striking and feature silk thread embroidery, which is worked on silk as well. 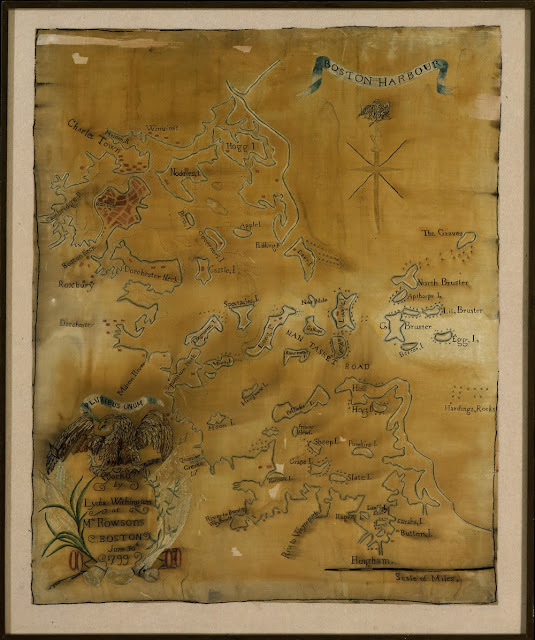 They are quite delicate, and you can see patches in both maps of shredded, split silk and losses to the support. Exposure to light has not been kind. It is not surprising that objects of this composition are quite ephemeral. The attempt at geographical accuracy was strong. That they come from the same source is clear. They share the conventional Federal motif of a majestic eagle and the vantage point is identical, as are the spellings of towns and bodies of water (“Boston Harbour”). What may not be as evident at first glance is the distinctive shift in the subject matter selected and what were deemed “acceptable” topics for a young lady’s education in the early republic. 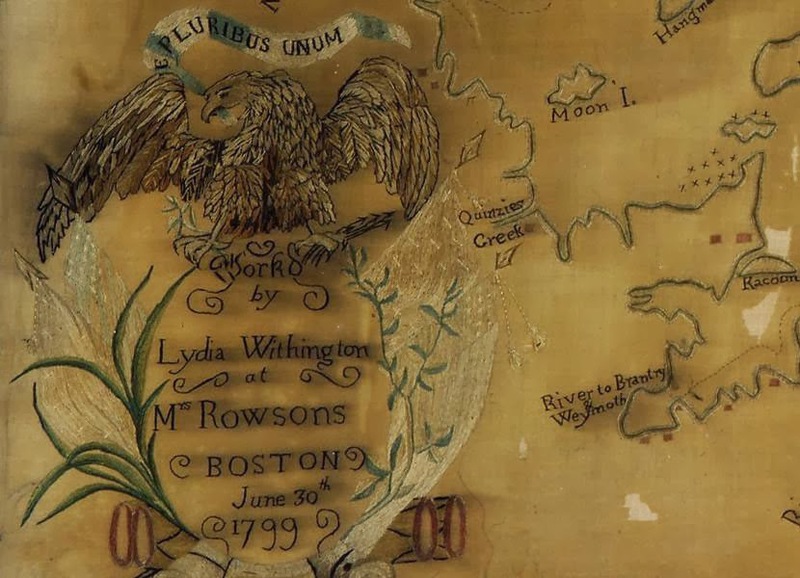 Mrs. Rowson, well-known as the author of Charlotte Temple had also published two books on geography—An Abridgement of Universal Geography (1805) and Youth's first Step in Geography (1811)--and clearly imparted her knowledge to her pupils. And, it appears, the parents (who were footing steep costs for tuition, extra lessons and supplies) found the shift from inward-oriented religious and family samplers to those which looked out upon a larger world were quite comfortable with this shift in ideas about a proper education for young women. It was, historically, a significant moment in post-Revolutionary America. 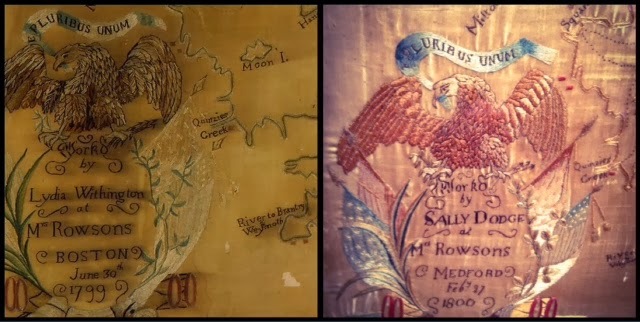 I do not believe that the two works have been shown together, and, so, I invite you compare, contrast and cogitate on these beautiful (but extremely fragile) maps and what they may represent regarding changing ideals of women’s education. 1. Kimberly S. Alexander, “Myra Montgomery’s World: Haverhill, Boston and Beyond” Historical New Hampshire, volume 67; Nos. 1& 2, Fall-Winter 2013. Is it the shoe, the stocking or the skirt?